Strong marketing materials help businesses stand out from their competition. It’s unnecessary to have a large variety of materials, however, a memorable logo attached to a reputable brand image goes a long way. Well thought out and made marketing materials bring your brand image together and help differentiate you from your competition. Having a memorable logo also attracts more clients, making your business look more established. Logos are a company’s first impression. The design and colors help conceptualize your business, giving people a perception of your organization. Logos give your brand an identity; something people can associate with you, your services, or your products. That’s why it’s critical to pay attention to your logo, what it conveys, and whether it stands the test of time. When it comes to logos, there comes a time for renovations and updates. Many major brands update or change their logo over the years. Why? There are a few reasons that companies choose to update their logos. Oftentimes, businesses change their logos because it feels outdated. Even Apple changed their logo! Though short-lived, the original logo was an image of Isaac Newton under the “fabled apple tree”. From 1976 to 1998, Apple-branded their business with a rainbow-colored bitten apple. The logo has been updated several times since 1998, evolving alongside the Apple products. Companies change their logo for various other reasons as well. Perhaps their logo was associated with an older product line, or there are negative associations with their logo and brand image. Logo changes also happen when one or more companies merge, expand their business, or in an effort to boost public appeal. Many popular logos belong to Fortune 500 companies. Adidas, Nike, Adobe, Amazon, IBM, Pepsi, and Nokia have all changed their logos at one point or another. In 2015 alone, 20 companies did some in-house renovating and changed their logos. Google included! An analysis of Fortune 500 company logos sheds some light on characteristics of successful logos and branding attempts. Capitalization and font are important facets of logos. 46% of all Fortune 500 companies use all capital letters in their logos, and 75% of the companies used Sans Serif fonts only. The analysis of the Fortune 500 companies showed pairing words and images is a common practice, even though some companies chose to use text only in their logos. 61% of companies paired images and words, while 37% of companies used text only in their logos. 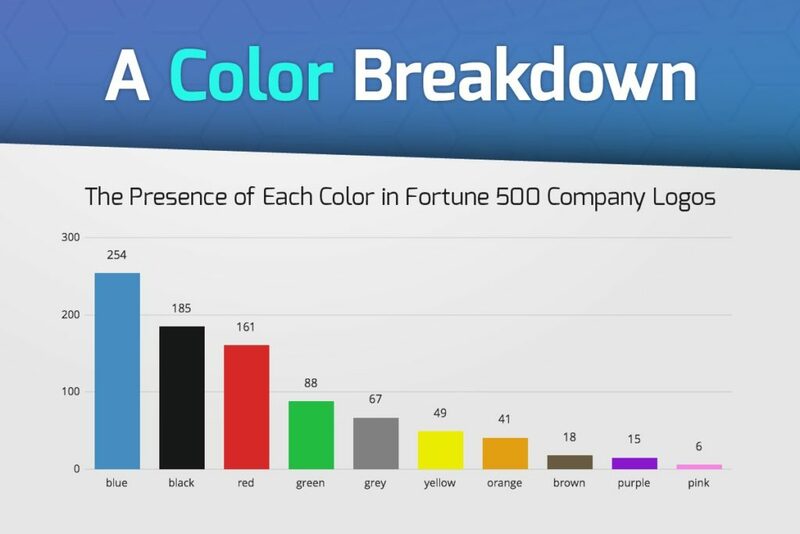 82% of all Fortune 500 companies use two or fewer colors in their logos. In this case, the most popular colors are blue, black, and red in that order. The most common three-color pairing was black, white, and red. In terms of the least used color, this analysis showed pink is rarely used in logos by Fortune 500 companies. Colors of a logo present an interesting opportunity to utilize color theory to your business’ advantage. Different colors influence consumer perception based on the color theory which is to say you can use colors to convey company values or characteristics. For example, blue is associated with professionalism, trust, strength, and dependability. Red implies boldness, excitement, and strength. Considering font, letter capitalization, and color combinations are necessary if you’re updating your logo. Deciding whether or not to include both text and image or to use text alone is another consideration to make if you’re redoing your marketing materials. These guidelines and insights can help you revamp your company’s logo and marketing materials to better brand your business. How Effective is Your Logo Design?